UM researchers document aspects of culture and history in the Caribbean when mapping often forgotten places. Throughout the Caribbean and around the globe, researchers from the University of Miami’s Center for Computational Science (CCS) are working to document areas of land, populations of people and pieces of history that have gone overlooked and undocumented. Engineers Chris Mader and Amin Sarafraz from CCS have applied the Center’s high-power technology and mapping techniques to better understand the historical and cultural preservation needs throughout the Caribbean. In the Bahamas, the once vibrant pink exterior of The Residency has chipped and faded, exposing its original craftsmanship. Surrounded by overgrown landscape, the historic mansion, built in 1913, is in rough shape. It is one of the only historic sites on the small caye of Harbor Island, and it seems only a matter of time before the landmark, once the home of the Commissioner of the Bahamas, disappears. In an effort to save a piece of culture and history, Mader, director of software engineering at CCS, and Sarafraz, an associate scientist in CCS's software engineering group, worked on-site with faculty and students from the University of Miami School of Architecture to produce meticulous digital images of The Residency. By combining CCS’s advanced technologies with traditional techniques of measuring, recording and drawing, the team worked to help architects, historians and preservationists fully visualize the details of the structure’s original build. The team accompanied an architecture course—taught by lecturer Rick Lopez and Associate Professor Teofilo Victoria—that teaches students U.S. National Park Service (NPS) standards for documenting historic buildings, producing images, maps and 3-D models that comply with U.S. Historic American Buildings Survey (HABS) guidelines. “When working on historical sites, it can be difficult for architects and historians to safely access buildings to conduct surveys and mapping,” says Mader. “The high-resolution composite images of The Residency provide a precise depiction of the original structure and composition of the mansion,” he adds. In addition to updating the mansion’s historical documentation, the research and images will be used to help secure funding and support to preserve a fundamental piece of Bahamian history. The work was also recently presented at an international conference in Havana to discuss the importance of preservation and documentation of historical sites throughout the Caribbean. Local community members of Las Flores, a small informal settlement along Colombia’s Caribbean coast, engage in a participatory mapping exercise led by Tim Norris and Chris Mader of UM’s Center for Computational Science. When Mader and Sarafraz partnered with researchers and architects from the School of Architecture at the University of Miami, they were tasked with finding an innovative and inexpensive way to map informal settlements and cities around the globe. Often viewed as slums or shantytowns, the informal settlements are typically removed from government services and infrastructure, leaving the land and its people undocumented and unexplored. According to Mader, these forgotten communities were generally established without the assistance of planners or architects, which creates additional challenges when recording and mapping their existence. Mader explains that the maps are created in a series of phases. Though each map is unique, the project begins by deploying a camera-equipped drone to capture hundreds of low-altitude aerial images. Combined with collected data and GPS surveying techniques, each captured image contains pixels that correspond to a location on the earth’s surface. Ultimately, through complex software and data processing, the photos and data are digitized to create a foundational geospatial system, or map. For many informal settlements, the high-resolution masterpieces produced by Mader and Sarafraz are the highest resolution documents of their structures. Throughout the Caribbean, the techniques and methodologies introduced by Mader and Sarafraz have established physical documentation—through mapping—of otherwise forgotten people and places. The impact of the mapping has been substantial, but recent work in remote areas off the coast of South America has unveiled the need for a more holistic approach. While mapping informal settlements along Colombia’s Caribbean coast, CCS scientists and a team of architects and engineers conceptualized a project that extended far beyond documenting the physical and environmental attributes of the unmapped land. Tim Norris, a CLIR (Council on Library and Information Resources) Postdoctoral Fellow in Data Curation at the University of Miami Libraries, joined the multidisciplinary team and the researchers moved forward with their vision of creating maps that could catalyze positive change. The process, called participatory mapping, empowers community members to engage in the map-making process and ultimately captures aspects of the community’s culture and needs. “We saw the potential to use the high-resolution digital map as a tool to better understand the culture and needs of the people,” Sarafraz says, as he recalls the first visit to Las Flores. From the team’s first high-resolution map of the informal settlement of Las Flores, it was apparent that the aerial images didn’t capture everything. From above, the shantytown appeared lifeless. Narrow dirt roads separated dilapidated structures and, other than a few sporadic trees, only one patch of grass could be seen. “A map is only the first step in the documentation and development process,” says Norris. “There are deeply rooted traditions and aspects of life that are equally important to capture,” he adds. Though other map scientists use participatory mapping in their work, the combination of this technique and the computational science of digital mapping used by the CCS team is groundbreaking. “The maps created through this project are meant to reflect the feelings of the community and what they want to communicate about themselves—their traditions and history,” says Mader. 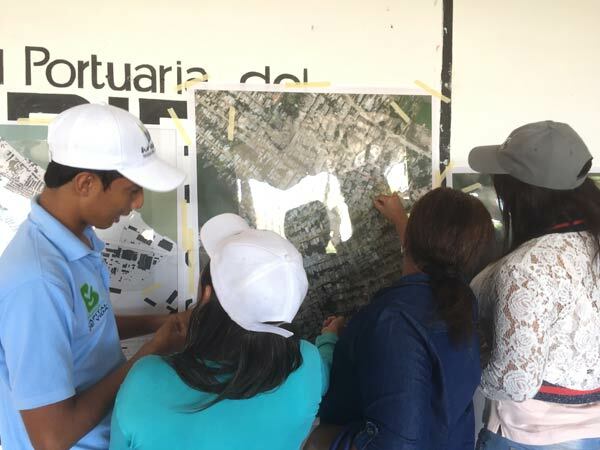 Mader and Norris returned to Las Flores in February 2017 to conduct the first participatory mapping demonstration workshop for local residents. Using the high-resolution aerial map as a tool to guide the conversations, the exercises were designed to discuss everything that couldn’t be seen from above. To start, the team of UM researchers unveiled the high-resolution images and maps of Las Flores to a handful of community leaders. For the first time, the people of the settlement had a clear vision of their environment; but just as participants were able to identify specific houses and structures on the map, they also became acutely aware of the vast array of surrounding vulnerabilities. Workshop participants were asked to discuss concerns, engage in conversation and provide insight into the daily challenges of life within the settlement. Within minutes, members of the once overlooked society found their voices. The discussion began with the desperate need for basic necessities such as clean water, electricity and medical care. But, as conversation continued, the group shifted to forward-thinking priorities. Residents used the map to pinpoint areas of opportunity for future development projects—an area to be used for garbage storage and removal, a space for a school and a park, and possibly even a security office to aid with concerns of violence and traffic. On paper, the long list of needs and concerns demonstrated a much different view of the informal settlement. Unlike the images and data captured from above, the participatory mapping exercise showed that the people of Las Flores were vibrant and deeply passionate about finding solutions for shortcomings within the community. Through participatory mapping, Mader, Sarafraz and Norris continue to blend the lines between complex computational science and anthropology to accurately document the land and culture of otherwise neglected societies.